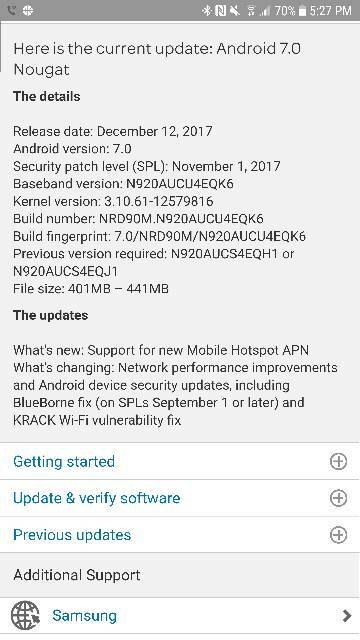 According to the release notes, it includes the KRACK vulnerability patch and the Blueborne fix. This update caused the Mobile Hotspot and Tethering to quit working requiring a reset of the network settings to fix it. I would get an error stating that the Mobile Hotspot ap was not available, could be due to a network issue, please call 611. Going into General Management, Reset, Reset Network Settings, resolved my issue. It does require re-pairing all devices after the reset.